Twenty One Pilots came out in a literal blaze of glory. 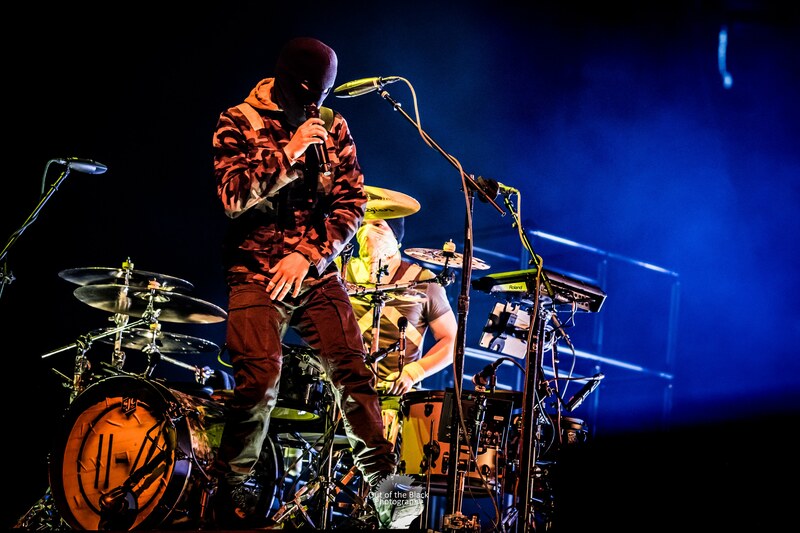 Wielding a torch, drummer Josh Dun arrived onstage with Tyler Joseph who quickly jumped up on a burning Cadillac, both performers commanding attention and holding it tight for the next two hours. A Twenty One Pilots show is an experience. When people talk about bands that you have to see live, Twenty One Pilots fits right into that category. The band opened with “Jumpsuit” off of their newly released album Trench. For their first trick, Joseph fell into the fiery car pit only to reappear seconds later in the doorway of one the entrances to the seated section evoking screams of surprise and wonder. They would continue surprising the crowd with different theatrics throughout the evening. The first set of songs saw 21P play many of their hit songs including “Stressed Out”, “Heathens”, and “Lane Boy”. Although Dun sticks primarily to drums, the placement of his kit establishes him as an equal part of the duo. Singer Joseph plays mostly piano but also grabs a bass or a ukulele from time to time. Both can jump around like well-trained acrobats. To the delight of the fans on the floor, after the first set of nine songs, the light rig lowered, turning into a skywalk for Joseph to walk over while singing “Nico and the Niners”. He landed on a second stage placed on the far side of the floor area, joking that since he was the lead singer, Dun had to walk to the second stage “like a normal person.” The set played on this stage was much more mellow, prefaced by Joseph’s request that everyone in the seated sections sit down. “We want to take a moment to honor our old fathers, so if you’d sit for the next few songs… they always say ‘Boys, give us a chance to sit!’” They then launched into “Taxi Cab,” followed by “Neon Gravestones,” “Bandito,” and “Pet Cheetah” before returning to the main stage. Back on the main stage, following an energetic rendering of “Holding On To You,” Joseph invited openers AWOLNATION and Max Frost onstage to “play some songs together.” They covered “Iris” by the Goo Goo Dolls and a fun Beatles’ “Hey Jude” to warm audience participation. After their tour mates left the stage, 21P slid into the hit song, “Ride” highlighted by some explosive drumming from Dun and more word for word audience participation. Next up was an MGMT-tinged “My Blood”. With the crowd pumped and more than supportive, they – get this – handed the crowd the drum kit on a small platform. Dun hopped up and the band launched into “Morph” while the crowd held him in their hearts and in their hands. Thick yellow confetti covered the band as the boys were now up on individual pedestals, lifted up by their fans while they banged on big bass drums bringing an amazing show to its energetic end. While there are obvious comparisons to Eminem, Twenty One Pilots go beyond rap and have a completely different vibe. Their lyrics grab the hearts and minds of fans sharing thoughts of self-awareness, self-doubt, nostalgia, angst, and a yearning to be loved and accepted. The show was just as much about the fans as the band. Displays of love smiles, and even tears were all over the sold-out Enterprise Center as the fans experienced the band in their own ways. The majority of the fans could sing along to nearly every song and Tyler let them “take the mic” on many occasions. The show was an audio and visual treat – I completely understood why the fans I spoke with told me that seeing them live was a game changer. The variety of music from ballad to rap to dance to rock was successfully varied and interesting. Smoke and fire, an incredible light show, videos, signature outfits, two stages and a high-speed connection to the crowd made this a show to remember.